Last week's Apple stock dividend hike of 10.5% has added another trophy to the company's wall of achievements. With the increase, Apple Inc.'s (Nasdaq: AAPL) total annual dividend payment will rise to $13.22 billion, making it the largest in the world. "They pay out more than U.S. Steel is worth," Howard Silverblatt, a senior index analyst with S&P Dow Jones Indices, pointed out in an email following Apple's earnings report. And naturally, the company Apple knocked out of the No. 1 position was Exxon Mobil Corp. (NYSE: XOM), which is expected to pay out $12.77 billion in dividends this year. 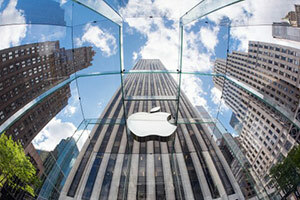 Apple fired its first warning shot in 2010 when it surpassed Exxon in cash on hand. Falling profits caused Exxon's cash pile to shrink to $36.76 billion, while Apple's cash surged to $51.31 billion. Apple now has the biggest cash pile of any company in the world with $256.8 billion. The first crown Apple took from Exxon was world's most valuable company. Apple first passed Exxon in market capitalization in 2011, but the oil giant didn't surrender without a struggle. Don't Miss: Five Double-Digit Dividend Plays to Secure Your "Second Salary"
The next title fell in 2015 when Apple bested Exxon's record for most profit earned in a year (excluding non-recurring revenue). Apple earned $53.4 billion in its fiscal 2015, easily topping the $45.22 billion Exxon Mobil earned in 2008. Just for some perspective, Apple's record profits in 2015 were so huge they were more than double that of the company with the second-largest profits, JPMorgan Chase & Co. (NYSE: JPM) with $24.4 billion. Now Apple has done it again, eclipsing Exxon's dividend payout. And as we've seen, Apple's lead only figures to get bigger. Apple has publicly committed to raising its dividend every year on several occasions, most recently during last week's Q2 earnings conference call. And it continues to rake in the most profits of any company on the planet. So as things stand, the Apple stock dividend will set a new world record every year for the foreseeable future. It will be a long time before Apple is dethroned as the dividend-paying king. Must See: For only the third time in 20 years, a metal more rare and more exotic than gold is about to make stock market history. And it's poised to make early investors a lot of money. Get the full story. Follow me on Twitter @DavidGZeiler and Money Morning on Twitter @moneymorning, Facebook, or LinkedIn.